This is one of the most inspiring books I have read in a long time. It’s also an excellent book on calling and vocation from an incredible young leader. Jena Lee Nardella, co-founder of Blood:Water Mission, writes that her vision of providing clean water for one thousand African communities came to her when she was just 21 years old. She writes that the only way to reach an audacious goal is slowly by slowly. As she tells her inspiring story she writes that the music that most resonated to her as a young woman was the 1995 debut album by Jars of Clay, one of my favorite bands. She tells us that she learned physical and relational skills at a camp she attended for several summers in Colorado that would one day carry her through the deserts of Africa and the rocky land of running a nonprofit organization. She tells of spending her allowance to feed the homeless and later working at a shelter. She writes that she was unaware at the time that connecting an overlooked community to a community of resource would become the vocational pattern of her life. At a Faces of Justice Conference held on the campus of Grand Canyon University in Arizona she met Dr. Steve Garber, a professor from Washington, D.C. Dr. Garber was the speaker at my graduation from Covenant Seminary in 2014, and the author of the excellent book Visions of Vocation, in which he writes about Jena and Blood:Water Mission. Garber introduced Jena to Jars of Clay, who were providentially playing a concert on her college campus the following week. Dan Haseltine, lead singer of the band, spoke about the AIDS crisis before the concert. After his talk, Jena met with the band to talk about their vision for an organization they wanted to begin. They called it Blood:Water Mission, a name derived from two things Africa urgently needs: clean blood (blood free from HIV) and clean water (water free from disease). Jars was using their platform as a popular band to talk about the AIDS crisis in Africa. They were looking for someone to turn their vision into a reality. That person would be Jena. She put together a proposal and sent it to the band, later moving to Nashville shortly after graduation to help them start Blood:Water. 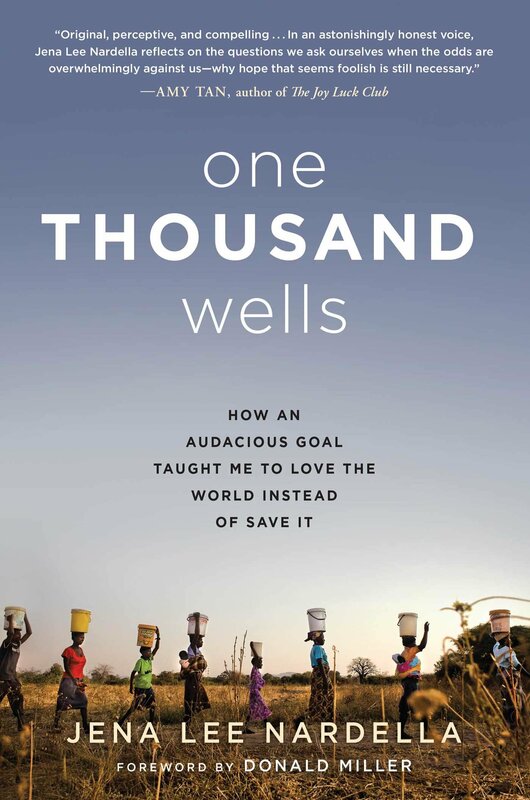 The 1000 Wells Project was a goal to provide a thousand communities in Africa, especially the ones affected by HIV, with clean water. Steve Garber helped her connect to people who could lend expertise and support to Blood:Water. The vision for Blood:Water would be more about Africa and less about Jena, the band and others who came alongside them in America. Africans would be the ones to solve the problems of their continent. Jena writes that the Africans were motivated to lead because the challenges of HIV and water were personal for them, and their own Christian faith called them to be agents of love. They had lost family members and neighbors to diseases that were preventable and treatable, and they wanted to stop the losses. Blood:Water’s vision would be accomplished through partnerships with local organizations such as Women’s Water Group. The 1000 Wells Project was officially launched in February, 2005, about eighteen months after Jena and the band had met on her college campus. She tells the story of the ministry’s fund-raising efforts, from Haseltine’s pleas at the end of each Jars concert to a breakthrough fund-raising effort at radio station K-LOVE. Jena and others would make many trips to Africa over the years to meet with the people of Africa and partner with local organizations. She writes that they learned that addressing water alone was simplistic. Water is just one leg of a three-legged stool if you’re trying to achieve real changes in health. The other two legs are hygiene and sanitation. Blood:Water started giving small grants to Africa-based organizations focused on water, sanitation, and hygiene. Eventually Blood:Water would begin to feel more like a reflection of Jena’s own dreams (going back to her days of feeding the homeless and working in the shelter), rather than just a response to Dan Haseltine’s vision. Jena writes of not only successes, but also of disappointments – a relationship with a young man who only wanted to be a friend when she longed for something more, the death of a partner in ministry, her frustration with evangelical ministries who wanted assurances that the gospel was being shared in addition to water being provided, and the leader of Women’s Water Group, who used funds donated for wells for his own personal benefit. She also writes of meeting James on a flight to Africa, who would become her husband and partner in the ministry. She writes that partnering directly with local people who are capable, compassionate, and hardworking and applying the values of dignity, relationship, and excellence is where you’ll see true success. She was convinced more than ever that real change happens with Africans leading the way. I highly recommend this inspiring and well-written book about a young woman who partnered with Jars of Clay on their vision and through her leadership achieved an audacious goal.